I don't have a lot of faith in beer reviews. Palates are all over the place when it comes to good beer. One man's trash is another man's treasure. The same goes for the many female beer fans out there. Indeed, there is a rumor in beer geek circles that women have more acute tasting skills than men. It's quite possibly true. While my interest in reviews is slim, I am very interested in comparative tastings. Here's why: Back in my college days, stereo buffs would go to the stereo store and compare the sound of speakers. You could listen to several kinds of speakers and pick the ones that suited your personal tastes. You sometimes realized speakers you thought sounded great in an apartment or room, sounded quite bad next to others of the same price. Likewise with beer. Most of us know what we like. We assume we have finely tuned pallets that allow us to intelligently pick what we like. That's a little like taking a set of speakers home and deciding they sound great. In my experience, comparative beer tasting has sometimes made me realize beers I thought were great aren't when compared with others in the same category. The color is a dark copper. Of the three beers, Brrr has the lightest color. It has a limited aroma, with vague hints of chocolate mixed with hops. The aroma becomes more evident as it warms up. Like Wassail and Jubelale, Brrr contains none of the spices people generally associate with winter beers. I was fairly impressed with Brrr. The color forecasts a lighter body than the other two beers and that's exactly what you get. This is not a bitter beer, although a decent hop character is present. Brrr has a slightly sweet finish, which I liked. I perceived the alcohol punch early on, and it became more pronounced as the beer warmed up. 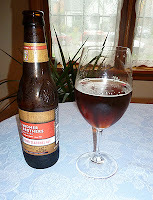 Still this is a well-balanced winter beer and very drinkable. Deep amber, tied with Jubelale for the darkest of the three. The aroma is milder than I expected. There are chocolate and caramel malts in there, mixed with a strong hop character. I recall earlier vintages of Wassail being particularly hoppy. The 2011 vintage seems a bit less so. The beer has a more pronounced body than the others, which disguises the alcohol nicely. Wassail is an intense beer, with strong chocolate overtones and bold hopping. Despite the intense flavors, I found it to be quite smooth and full of flavor. These flavors will likely get better with a bit of aging. 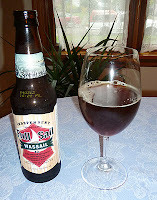 Wassail does not have the sweet finish of the Brrr. Northwest beer fans will like the hoppy character, I think. Dark amber in color, arguably the darkest of the three beers. The aroma is not particularly intense. Hints of chocolate malt and brown sugar mixed with a blast of hops. Again, there are no seasonal spices in this beer. If you detect nutmeg or cinnamon, it's in your nose. Jubelale has a medium body, about on par with Wassail. 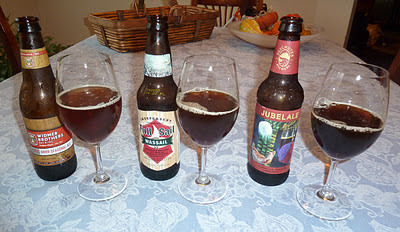 Jubelale has been one of my favorites for many years, but the 2011 vintage seems a little off. This is a bold beer with great body and character. But it possesses an astringent, tannic quality that overwhelms the pallet. There are various reasons this could have happened, intentional or not. I'm not going to speculate. Nonetheless, it creates a serious distraction. There is a chance the tannic element may be reduced with time. That's the case with good red wine. We have a flight of big Cabs in the wine cellar simmering, some needing many years to finish. 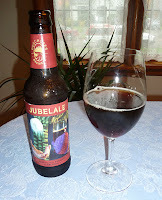 It's possible 2011 Jubelale will be better with a bit of aging. I plan to cellar a few bottles and find out. Check back in a year or two. For those keeping track at home, these are my rankings. Opinions will differ.